Hello all! What a glorious & hot day the Lord has made. Just wanted to check in with you all, its been quite a busy weekend. New posts coming soon. I hope everyone is doing well with their personal "pushup" challenges! We're heading to Week 3! I digress! I wanted to pop in and introduce a new feature on the blog entitled "Frugal...Finds". The ellipses are present because on the posts I will discuss my fondness of the clearance rack and affinity for finding coupons & sales. This will include beauty items, clothing, housewares, etcetera, etcetera. Just whatever I need at the time, if I'm shopping, I'll share. So why not use this platform to do so! Here I found this top at JCP marked down & at $12 but at register it scanned as $5. (Woohoo!) 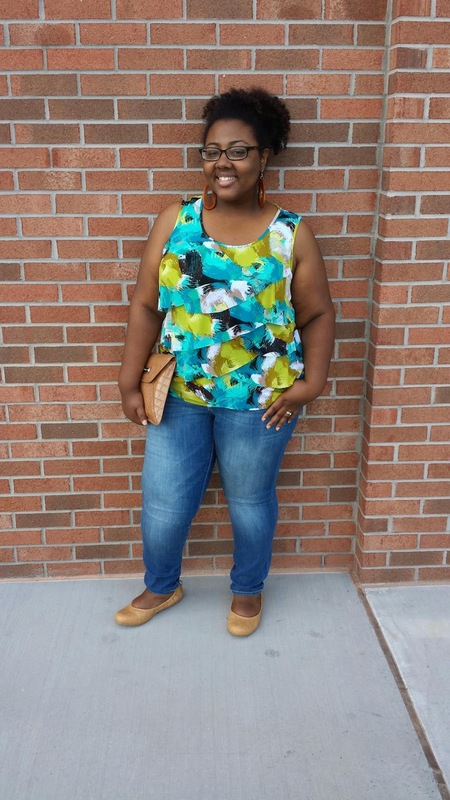 The jeans are from Old Navy, marked down to $14.99. Shoes were clearance at Avenue for $16.99 (originally $48). Lastly, the wooden earrings were purchased this weekend at #CurlGoneWild event for a mind-shattering $3!!! You can do this people! I like to have new pieces in my wardrobe but I'm realistic & #FrugalFinds are the way to go! Some people are all about the benjamins, well I'm all about the savings!